Jeffry Odell Korgen is a writer and social-ministry consultant. His books on faith-based social action and social-justice comics with Kevin C. Pyle and others can be found at korgen.associates. 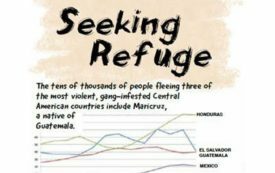 A graphic interview from a women’s shelter in Nogales, Mexico. A graphic interview with two Dreamers in El Paso.